The Department of Education (DepEd) headed by Bro. Armin A. Luistro, FSC , together with Hon. Patricia Licuanan as the Chairperson of the Commission on Higher Education (CHED) and the Technical Education Skills Development Authority (TESDA) with its Director General Joel Villanueva signed the Implementing Rules and Regulations (IRR) of the “Enhanced Basic Education Act of 2013 (Republic Act No. 10533). Last September 4, 2013 at Don Alejandro Roces National High School, A. Roces Ave. cor. Sct. Tuazon, Brgy. Obrero, Quezon City. With the signing of the IRR, we as parents are rest assured that the changes made which promised a more developed and effective educational system in our country shall now be fully implemented not later than 2016. 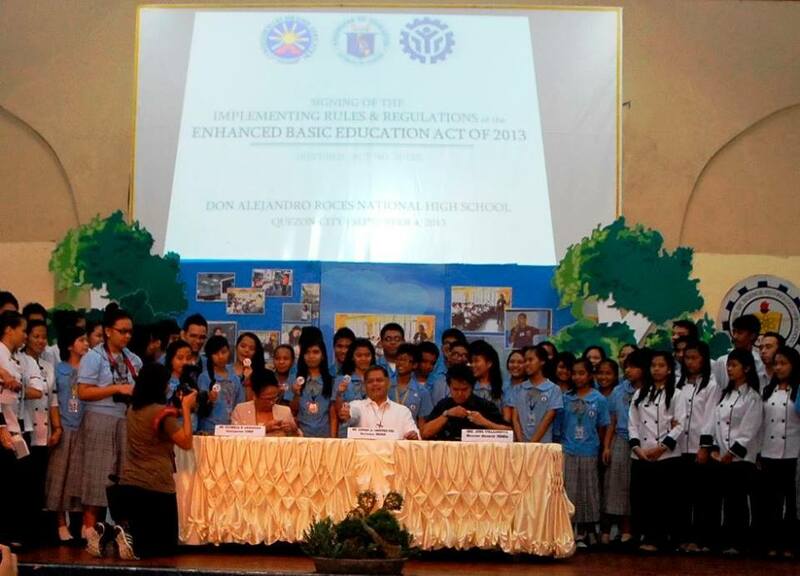 DepEd envision to equip our learners and the entire Filipino nation with a globally-competitive system of education. The provisions of this IRR shall primarily apply to all public and private basic educational institutions and learning centers. This IRR shall also apply to Higher Education Institutions (HEIs), Technical-Vocational Institutions (TVIs), duly recognized organizations acting as Teacher Education Institutions (TEIs), and foundations. The enhanced curriculum system is a modified version of the acquired curriculum which is more geared to meeting the diverse needs of our present students. Let me give you a glimpse of what is indicated on the IRR. "Pursuant to Section 3 of the Act, basic education is intended to meet basic learning needs which provides the foundation on which subsequent learning can be based. It encompasses kindergarten, elementary, and secondary education as well as alternative learning systems for out-of-school learners and those with special needs under Section 8 of this IRR." " Kindergarten Education is the first stage of compulsory and mandatory formal education which consists of one (1) year of preparatory education for children at least five (5) years old as a prerequisite for Grade 1. As educators, advocates and parents we are bound by the law under this implementation that..."It shall be compulsory for every parent or guardian or other persons having custody of a child to enroll such child in basic education, irrespective of learning delivery modes and systems, until its completion, as provided for by existing laws, rules and regulations." Indigenous Peoples (IP) Education Program. For more updates on K to 12, or other DepEd related info log on to their FACEBOOK page. Great post - thanks for the information. Have a look at our website no win no fee and leave comments and ratings.